Luzhniki Stadium (Russian: стадион «Лужники», IPA: [stədʲɪˈon lʊʐnʲɪˈkʲi]) is the national stadium of Russia, located in its capital city, Moscow. The full name of the stadium is Grand Sports Arena of the Luzhniki Olympic Complex. Its total seating capacity of 81,000 makes it the largest football stadium in Russia and one of the largest stadiums in Europe. The stadium is a part of the Luzhniki Olympic Complex, and is located in Khamovniki District of the Central Administrative Okrug of Moscow city. The name Luzhniki derives from the flood meadows in the bend of Moskva River where the stadium was built, translating roughly as "The Meadows". Luzhniki was the main stadium of the 1980 Olympic Games, hosting the opening and closing ceremonies, as well as some of the competitions, including the final of the football tournament. A UEFA Category 4 stadium, Luzhniki hosted UEFA Cup Final in 1999 and UEFA Champions League Final in 2008. The stadium also hosted such events as 1973 Summer Universiade and 2013 World Championships in Athletics. It was named the main stadium of 2018 FIFA World Cup and hosted 7 matches of the tournament, including the opening match and the final. In the past its field has been used as the home ground (at various times) for football games played by CSKA Moscow, Spartak Moscow and Torpedo Moscow, however, there are currently no clubs based at the stadium. Today it is mainly used as one of the home grounds of the Russian national football team. The stadium is used from time to time for various other sporting events and for concerts. It is also used to host Russian domestic cup finals. The stadium is located in Khamovniki District of the Central Administrative Okrug of Moscow city, south-west of the city center. The name Luzhniki derives from the flood meadows in the bend of Moskva River where the stadium was built, translating roughly as "The Meadows". It was necessary to find a very large plot of land, preferably in a green area close to the city center that could fit into the transport map of the capital without too much difficulty. According to one of the architects: "On a sunny spring day of 1954, we, a group of architects and engineers who were tasked with designing the Central stadium, climbed onto a large paved area on the Lenin Hills... the proximity of the river, green mass of clean, fresh air - this circumstance alone mattered to select the area of the future city of sports... In addition, Luzhniki is located relatively close to the city center and convenient access to major transport systems with all parts of the capital". It was one of the few major European football stadia to use an artificial pitch, having installed a FIFA-approved FieldTurf pitch in 2002. However, a temporary natural grass pitch was installed for the 2008 UEFA Champions League Final. In August 2016 a permanent hybrid turf was installed, consisting of 95 percent natural grass reinforced with plastic. On 23 December 1954, the Government of the USSR adopted a resolution on the construction of a stadium in the Luzhniki area in Moscow. The decision of the Soviet Government was a response to a specific current international situation: By the early 1950s, Soviet athletes took to the world stage for the first time after the Great Patriotic War, participating in the Olympic Games. The 1952 Summer Olympics in Helsinki brought the Soviet team 71 medals (of which 22 gold) and second place in the unofficial team standings. It was a major success, but the increased athletic development of the Soviet Union, which was a matter of state policy, required the construction of a new sports complex. The proposed complex was to meet all modern international standards and at the same time serve as a training base for the Olympic team and arena for large domestic and international competitions. The stadium was built in 1955–56 as the Grand Arena of the Central Lenin Stadium. Building materials came from Leningrad and the Armenian SSR, electrical and oak beams for the spectator benches from the Ukrainian SSR, furniture from Riga and Kaunas, glass was brought from Minsk, electrical equipment from Podolsk in Moscow Oblast, and larch lumber from Irkutsk in Siberia. It was necessary to demolish a whole area of dilapidated buildings (including the Trinity Church, which is supposed to be restored). Because the soil was heavily waterlogged, almost the entire area of the foundations of the complex had to be raised half a meter. 10,000 piles were hammered into the ground and dredgers reclaimed about 3 million cubic meters of soil. The stadium was officially opened on 31 July 1956, having been built in just 450 days. It was the national stadium of the Soviet Union, and is now the national stadium of Russia. The stadium was the chief venue for the 1980 Summer Olympics, the spectator capacity being 103,000 at that time. The events hosted in this stadium were the Opening and Closing Ceremonies, Athletics, Football finals, and the Individual Jumping Grand Prix. On 20 October 1982, disaster struck during a UEFA Cup match between FC Spartak Moscow and HFC Haarlem. 66 people died in the stampede, which made it Russia's worst sporting disaster at the time. In 1992, the stadium was renamed Luzhniki Stadium. An extensive renovation in 1996 saw the construction of a roof over the stands, and the refurbishment of the seating areas, resulting in a decrease in capacity. The stadium hosted the 1999 UEFA Cup Final in which Parma defeated Marseille in the second UEFA Cup Final to be played as a single fixture. 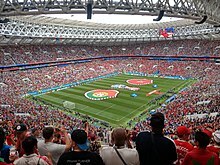 The Luzhniki Stadium was chosen by UEFA to host the 2008 UEFA Champions League Final won by Manchester United who beat Chelsea in the first all-English Champions League Final on 21 May. The match passed incident-free and a spokesman for the British Embassy in Moscow said, "The security and logistical arrangements put in place by the Russian authorities have been first-rate, as has been their cooperation with their visiting counterparts from the UK." In August 2013, the stadium hosted the World Athletics Championships. The original stadium was demolished in 2013 to give a way for the construction of a new stadium. The self-supported cover was retained. The facade wall was retained as well, due to its architectural value, and was later reconnected to a new building. Construction of the new stadium was completed in 2017. The 2018 FIFA World Cup was awarded to Russia and the Luzhniki Stadium was selected by the Russia 2018 FIFA World Cup bid as the venue for the opening match and also the final, which was held on 15 July 2018. The stadium joins Rome's Stadio Olimpico, London's old Wembley Stadium, Berlin's Olympiastadion and Munich's Olympiastadion as the only stadiums to have hosted the finals of the FIFA World Cup and UEFA's European Cup/Champions League and featured as a main stadium of the Summer Olympic Games (Saint Denis' Stade de France is scheduled to become another in 2024). The stadium's capacity was increased from 78,000 to 81,000 seats, partly caused by the removal of the athletics track around the pitch. 1956 – Summer Spartakiad of the Peoples of the USSR. 1957 – Ice Hockey World Championship. 1957 – VI World Festival of Youth and Students. 1959 – II Spartakiad of the People of the USSR. 1960 – Ice Speedway World Championship. 1961 – World Modern Pentathlon Championship. 1962 – World Speed Skating Championship. 1963 – III Spartakiad of the Peoples of the USSR. 1967 – IV Spartakiad of the Peoples of the USSR. 1971 – V Spartakiad of the Peoples of the USSR. 1974 – World Modern Pentathlon Championship. 1975 – VI Spartakiad of the Peoples of the USSR. 1979 – VII Spartakiad of the Peoples of the USSR. 1980 – Summer Olympic Games, including opening and closing ceremonies. 1984 – Ice Speedway World Championship. 1984 – Friendship Games, including opening and closing ceremonies. 1985 – XII World Festival of Youth and Students. 1986 – Goodwill Games, including the opening ceremony. 1997 – Russia vs. FIFA team in honor of the 850th anniversary of Moscow, the 100th anniversary of Russian football and the opening after the reconstruction of the Luzhniki stadium. 1998 – First World Youth Games, including the opening ceremony. 1999 – UEFA Cup Final: Olympique de Marseille (France) vs. Parma (Italy). 2013 – Rugby World Cup Sevens. 2013 – World Championships in Athletics. 2018 – FIFA World Cup, including the final match. May 1983 – Three-day festival Rock for Peace. 1987 – Festival of Soviet-Indian Friendship. 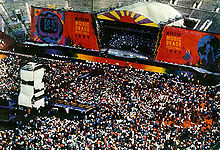 12–13 August 1989 – The Moscow Music Peace Festival was held at the stadium. Bands such as Bon Jovi, Scorpions, Ozzy Osbourne, Skid Row, Mötley Crüe, Cinderella, Gorky Park took part in the event. 24 June 1990 – As part of the festival of the newspaper Moskovsky Komsomolets, the last concert of Viktor Tsoi and the Kino band took place. 29 June 1991 – As part of the holiday of the newspaper Moskovsky Komsomolets Oleg Gazmanov took part in the concert. It was the last time the Olympic flame was lit at the stadium. 20 June 1992 – A concert took place in memory of Viktor Tsoi. DDT, Alisa, Nautilus Pompilius, Joanna Stingray, Brigada S, Chaif, Kalinov Most and others took part in the event. 15 September 1993 – A concert by Michael Jackson took place as part of the Dangerous World Tour; this was Jackson's first performance in Russia. 1997 – Performance, dedicated to the 850th anniversary of Moscow. 11 August 1998 – The Rolling Stones performed at the stadium for the first time in Russia. 28 February 2003 – The Agata Kristi band played a concert in honour of its 15th anniversary. 12 September 2006 – Madonna came to Russia and performed at the stadium for the first time, as part of her world Confessions Tour. 18 July 2007 – Metallica played a concert at the stadium for the first time, 16 years after the first arrival in Russia, as part of the Sick of the Studio '07 tour. 26 July 2008 – The holiday "MosKomSport - 85 years" was held. During it a concert took place, in which the bands U-Piter, Chaif, Crematory and others took part. 9 May 2010 – A festive concert dedicated to the 65th anniversary of the Victory in the Great Patriotic War took place. 25 August 2010 – A concert of U2 took place as part of the U2 360° Tour. 22 July 2012 – The Red Hot Chili Peppers with the support of Gogol Bordello gave a concert on the stage of the complex. 2011–2013 – A musical competition Factor A was held in the complex. 31 May 2014 – A concert of the Mashina Vremeni band dedicated to its 45th anniversary was held in front of the stadium, which was closed for the renovation. 29 August 2018 – Imagine Dragons will perform at the stadium as part of the Evolve World Tour. When the Luzhniki Stadium hosted the final game of the 1957 Ice Hockey World Championship between Sweden and the Soviet Union, it was attended by a crowd of 55,000 and set a new world record at the time. On 23 May 1963, Fidel Castro made a historic speech in Luzhniki Stadium during his record 38-day visit to the Soviet Union. New Japan Pro Wrestling, the Japanese professional wrestling promotion, ran a show in 1989. Luzhniki Stadium also makes an appearance in the Russian supernatural thriller film Night Watch (Russian: Ночной дозор, Nochnoy Dozor), during the power shut-down scene when the power station goes into overload. The stadium is seen with a match taking place, and then the lights go out. In 2008, Manchester United beat Chelsea on penalties after a 1–1 draw to win their third European Cup. This was United's third appearance in the final, and Chelsea's first. Luzhniki Stadium hosted seven games of the 2018 FIFA World Cup, including the opening and the final matches. During the World Cup, Luzhniki had six access control stations with 39 inspection lines, and seven access control points with 427 entrances for fans arriving on foot. The grounds were serviced by 3,000 surveillance cameras and about 900 scanners, monitors, and detectors. The stadium stands included special observation areas for people with disabilities, which offered space for wheelchairs and accompanying persons. In addition, after the reconstruction, the stadium was equipped with special extra-wide seats for plus-size spectators. Additional services for spectators available at the stadium: navigation assistance from volunteers, storage rooms, registration of children, lost and found office, and audio descriptive commentary for blind or visually impaired fans. ^ "Luzhniki Stadium". FIFA. Retrieved 15 June 2018. ^ "TASS: Sport - Reconstruction of World Cup 2018 opening match stadium to cost 350 mln euros". Special.tass.ru. 9 July 2015. Retrieved 6 June 2018. ^ "История создания комплекса" [Moscow to host Champions League final on natural grass]. Luzhniki Stadium. Retrieved 10 December 2016. ^ "Moscow to host Champions League final on natural grass". ESPN. 5 October 2006. Archived from the original on 26 February 2014. ^ Cadden, Phil (9 November 2016). "World Cup 2018: Final in Russia will be played on a plastic pitch for the first time". The Sun. London. Retrieved 16 June 2018. ^ a b "Luzhniki Stadium". The Stadium Guide. ^ Flanagan, Aaron (22 September 2017). "Russia World Cup final venue completed as new look Luzhniki Stadium is revealed". mirror. Retrieved 7 December 2017. ^ 1980 Summer Olympics official report. Archived 18 November 2008 at the Wayback Machine Volume 2. Part 1. pp. 48-51. ^ Зайкин, В. (20 July 1989). Трагедия в Лужниках. Факты и вымысел. Известия (in Russian) (202). Retrieved 6 February 2012. ^ Halpin, Tony (22 May 2008). "Moscow proud of trouble-free Champions League final". London: The Times. Retrieved 22 May 2008. ^ "Реконструкция Лужников - образец заботы о культурном наследии - мэр". m24.ru. ^ "2018 World Cup: A guide to the grounds hosting games in Russia". BBC Sport. 30 November 2017. Retrieved 6 December 2017. ^ "See the incredible snaps as workmen complete new-look 81,000-seater Moscow stadium in time for 2018 World Cup Final". The Sun. 23 March 2017. Retrieved 7 December 2017. ^ FIFA.com (1 January 1900). "Luzhniki Stadium blossoms as it prepares for a new chapter". FIFA.com. Retrieved 7 December 2017. ^ "Luzniky Stadium". Red Hot Chili Peppers. Archived from the original on 22 February 2014. ^ "Match report – Group A – Russia - Saudi Arabia" (PDF). FIFA.com. Fédération Internationale de Football Association. 14 June 2018. Retrieved 14 June 2018. ^ "Match report – Group F – Germany - Mexico" (PDF). FIFA.com. Fédération Internationale de Football Association. 17 June 2018. Retrieved 17 June 2018. ^ "Match report – Group B – Portugal - Morocco" (PDF). FIFA.com. Fédération Internationale de Football Association. 20 June 2018. Retrieved 20 June 2018. ^ "Match report – Group C – Denmark - France" (PDF). FIFA.com. Fédération Internationale de Football Association. 26 June 2018. Retrieved 26 June 2018. ^ "Match report – Round of 16 – Spain - Russia" (PDF). FIFA.com. Fédération Internationale de Football Association. 1 July 2018. Retrieved 1 July 2018. ^ "Match report – Semi-final – Croatia - England" (PDF). FIFA.com. Fédération Internationale de Football Association. 11 July 2018. Retrieved 11 July 2018. ^ "Match report – Final – France - Croatia" (PDF). FIFA.com. Fédération Internationale de Football Association. 15 July 2018. Retrieved 15 July 2018. ^ "Три тысячи камер и другие факты о подготовке "Лужников" к ЧМ-2018". Wikimedia Commons has media related to Luzhniki Stadium.